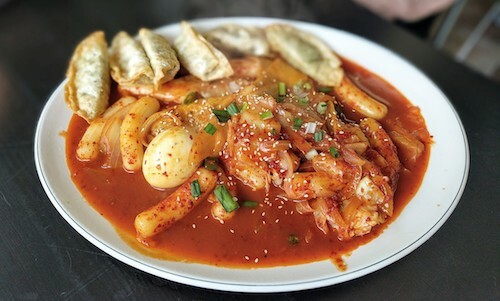 As Main Street climbs up the hill and west away from Fort Lee, a quiet area claims the home of a tiny Korean takeout joint that is cooking homemade meals at good prices. A few "last exit" customers jumping off I-95 might wander in, but for the most part it seems geared towards a regular lunch crowd who live and work in the area. For those not taking their food to go, there are a couple seats available. No inquiries were made to the nature of relationships between people working here, but it seemed like it was a family. On the day of this meal, only grandma (not her real name) seemed to be around upon arrival. She looked busy in the kitchen and took a while to approach the counter to help us despite the place being empty. Once she arrived and we went through ordering, it was apparent she might have been wasting time in hopes of the arrival of grandson (not his real name), who usually interacts with English-speaking customers like ourselves. No matter though, the numbered menu made it easy for us all to make selections and we sat down as she began preparing the meals. Once grandson did arrive, grandma seemed to give him a little piece of her mind for being late, but he went through the rest of the prep for us and everything settled into place. Later, father (or son, not his real name) arrived with groceries, and three generations were all working together. Off the "Korean fast food menu" section, we eagerly ordered the spicy rice cakes with vegetables and fried dumplings ($11.99, above), a massive plate that is well described by its name. The rice cakes, cabbage, and egg are almost drowned in a wonderful sauce that balances sweet and spicy perfectly. 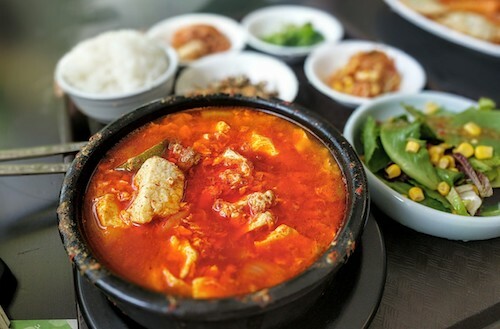 The other order of beef soft tofu soup ($8.99) came as shown below with a round of assorted banchan, rice, and a salad. Both dishes were quite good deals for the price, and were far too much for the two of us despite being very hungry. The sundubu here has a strong feeling of being homemade, full of beef stock and warmth. On a return visit, one of their featured bulgogi dishes seems like a wise choice, probably feeling this same way.